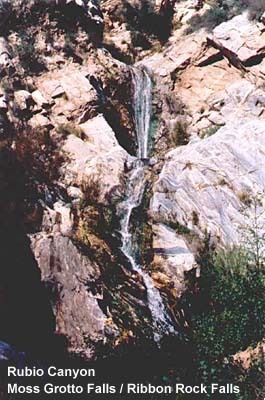 As of October 2004, the historic waterfalls of Rubio Canyon can once again be enjoyed. 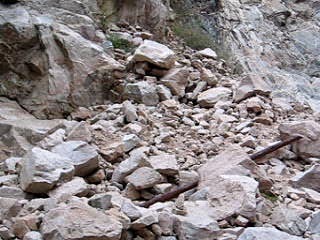 Since 1998, four falls were buried under tons of rock  the result of egregious negligence by the contractor working for the Rubio Canyon Land and Water Company. But all that changed by a huge early-season storm that dropped some 10 inches of rain. The gullywasher dislodged the 80-foot pile of debris from the narrow gorge and uncovered the falls (see News Links below). This short hike once again offers a delightful reward. 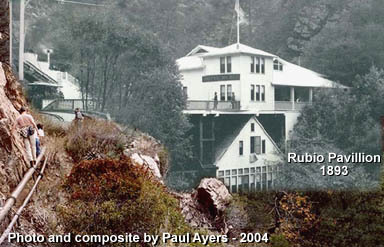 Rubio Canyon was the site of Professor Thaddeous Lowe's elegant Rubio Pavilion and the lower terminal for the famous incline tram. 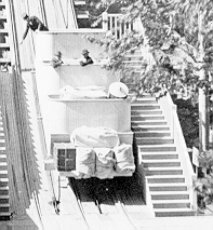 From 1893 through 1936 the "White Chariots" carried thousands of passengers to the "White City" on Echo Mountain  the starting point of the Mount Lowe Railway, Alpine Division. In 1909, giant boulders dislodged by a severe storm destroyed the double-deck pavilion. Today there are only a few traces of the historic past in Rubio Canyon. But with some imagination and old photos, the hiker can picture what it must have been like 100 years ago. The first half mile of this hike follows a decent trail to the site of the pavilion. The last quarter mile follows the rocky and brushy creek bed to Moss Grotto Falls and Ribbon Rock Falls. 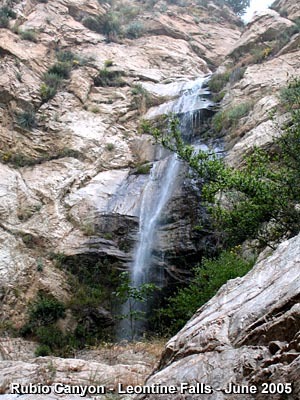 If you are adventurous you can extend your hike and follow some steep, informal paths to view some of the other falls of Rubio Canyon. The hike is mostly in open sun, so in the summer and early fall it could be quite hot and the falls may not have much water. In June you may have some marine layer providing relief from the heat. In the hot months, try avoiding the heat by hiking at dawn. See Seasons of the San Gabriels for a detailed description of minding the seasons. From the I-210 Foothill Freeway passing through Pasadena: exit at Lake Avenue and turn north (toward the mountains). After 2.7 miles on Lake Avenue you cross over Altadena Drive. In another 0.1 mile turn right unto Palm Drive. After a block veer left onto Maiden Lane. After another few blocks turn right on Rubio Canyon Drive. Drive a few more blocks and turn left on Rubio Crest. After a half block, turn right on Rubio Vista Road and drive one block to the intersection of Rubio Vista Road and Pleasant Ridge Drive. The trail begins on the right between the two houses (1351 and 1342) on the corner. Park on the street. Of course no Forest Adventure Pass is needed since this hike begins in a residential neighbourhood. 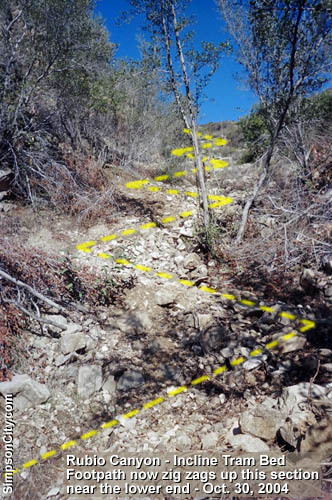 From the trailhead, walk between the two houses to find the footpath that contours along the west slope of Rubio Canyon, far above the creek. The trail follows the old rail bed of the historic trolley line, but after years of erosion, the rail bed is barely distinguishable. But the hiking trail is usually in good condition and offers a nice stroll. After about a half mile you'll encounter a section of water pipe that parallels the trail. Looking straight ahead just past the large oak tree is the site of the Rubio Pavilion. In another minute you'll negotiate another occurrence of the pipe (or if you veer right, you'll come upon the remnants of the pavilion foundation. Then follow the path to the second occurrence of the pipe). At this point, follow the path down to creek bed. Hike up the open streambed (north) (see "Rough route" under Trail Notes below). 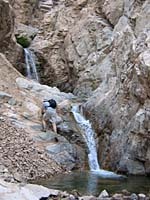 Prior to the massive debris flow of October 2004, you would be greeted by three small falls in routeMaidenhair Falls, Cavity Chute, and Bay Arbor Falls. But today they are covered with tons of rock that had been previously covered the bigger falls upstream. 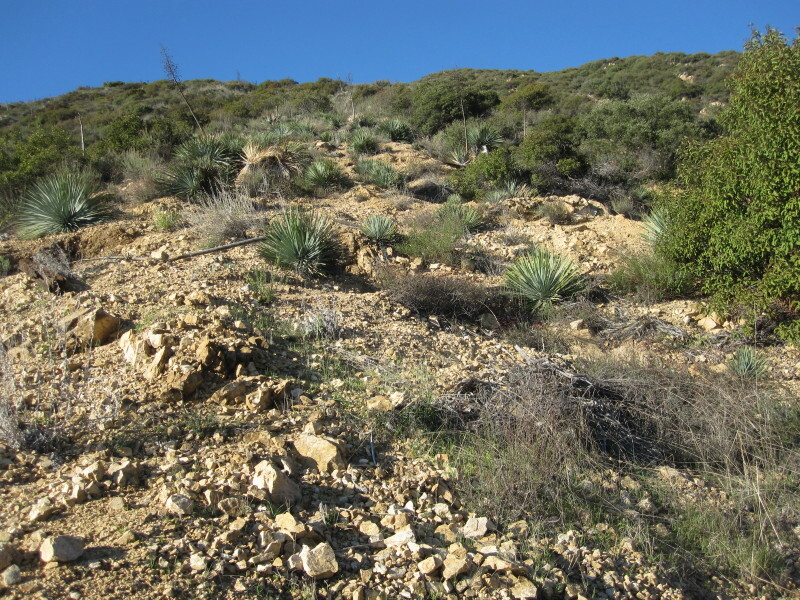 In the years since 2004, plant life has come back along the stream bed and softens the effects of the debris flow, but also posses additional obstacles to negotiate. View the Maidenhair Falls photo page. After a quarter mile of scrambling up the streambed, you arrive at the base of a picturesque double falls. The lower one is Ribbon Rock Falls and the upper one is Moss Grotto Falls. These had been buried under the huge rock slide, but now once again can be enjoyed. Ribbon Rock is now only a fraction of its former glory (see old photo compliments of Paul Ayers). 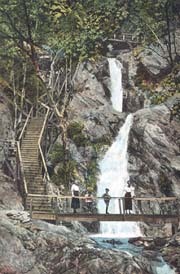 In the hayday of Rubio Canyon, there were stairways and catwalks in which visitors could continue up the canyon and enjoy Grand Chasm Falls (a stone's throw upstream from Moss Grotto Falls), Lodged Boulder Falls, Roaring Rift Falls, and the breathtaking 80-foot Thalehaha Falls. Enjoy your visit to Moss Grotto and Ribbon Rock. Unless you're compelled to explore further, return the way you came. . The changing faces of Moss Grotto Falls and Ribbon Rock Falls. Grand Chasm Falls (aka Rainbow Falls) - To view the next falls upstream, take the steep path that heads up the ravine on right (east). After about a 100 yards, there will be another path splitting off to the left. To visit Grand Chasm Falls, turn here and climb this route back toward the main canyon. The route can be rough and precarious, so proceed with care. After a few minutes, you will descend into the canyon arriving at the top of Moss Grotto Falls. Look to your right and take in the beauty of Grand Chasm Falls. As you approach it on the left, look toward the top of the falls and you can see the remains of a small dam which used to provide electric power for the facilities below. Behind the dam was a small pond called Mirror Lake. After your visit here, return back to the trail junction in the ravine. View the Grand Chasm Falls photo page. Thalehaha Falls Overlook - From the ravine continue up (east) about 100 yards to where the trail cuts sharply to the left, climbing steeply up the slope, northwest (there is a fig tree adjacent). Your path will take you through a healthy stand of fountain grass (pennisetum setaceum). After a lot of huffing and puffing you'll reach a large outcropping of rock. The views of the waterfalls below are guaranteed to elicit oos and ahs. The larger of the two falls below is Thalehaha Falls (aka Bridal Veil Falls), with water cascading some 80 feet. Below it is Roaring Rift Falls. Downstream, out of view from this vantage point is Lodged Boulder Falls. Be careful around the edge of this overlook; it's a 130-foot sheer drop to the canyon bottom! View the Thalehaha Falls photo page. Leontine Falls - After enjoying your views of Thalehaha and Roaring Rift Falls, I recommend heading back. However, the observant hiker will notice a trail continuing northeast up the ridge. 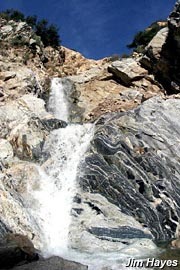 The ardent explorer will be compelled to press on to Leontine Falls, the crowing jewel of the falls of Rubio Canyon. But unless you are in good physical condition and have mountain goat agility, don't even think about continuing on. This trail is not for the timid or inexperienced. The route is steep and rough with loose footing in places and can get brushy if it doesn't get periodic trimming. If you choose the challenge to venture on, in the next 15 to 20 minutes you'll climb 180 vertical feet then descend to a ridge offering partial views down toward Leontine Falls. This is as far as you'll go unless you really are daring. The route cuts back to the northeast toward the falls, dropping perilously 120 feet to the canyon bottom. Ropes attached to trees make the descent doable, but heart pounding (Note: it's usually not a good practice to rely on make-shift safety ropes left from a previous party. So use with caution and at your own risk). And once to the bottom you must climb back out the same way, so don't commit to this adventure unless you're confident you have the ability to get out. The route delivers you to the gorge below Leontine Falls. To climb to the base of the falls or to explore downstream, you'll need some elementary rock climbing skills. Again, this trek to Leontine Falls is not for the general public, but only for those with advanced outdoor skills. You assume all liability if you attempt this route. Return the way you came. 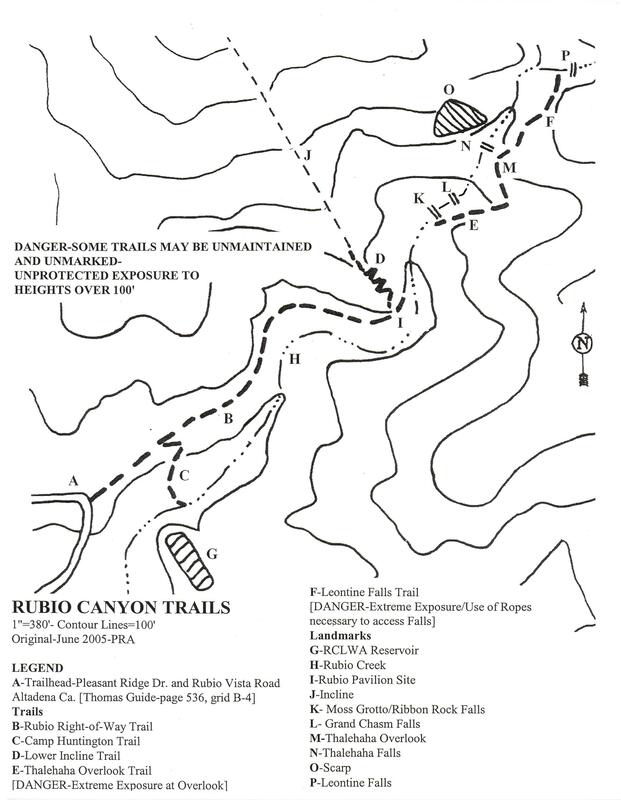 To descend into Rubio Canyon, see "Alternate routes from Echo Mt." under Trail Notes below. View the Leontine Falls photo page. 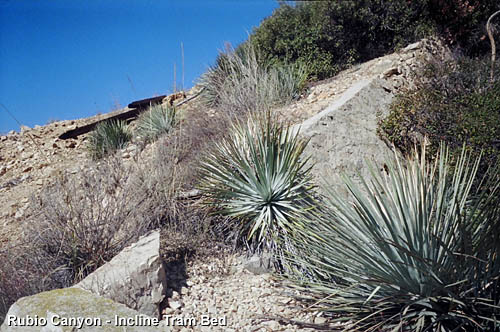 Incline Tram Bed - If you have some mountain goat tendencies and are up for some adventure, you can do some exploring up the old incline tram bed. And if you want to climb all the way to Echo Mountain, the route combines three separately named trails, climbing 1,300 feet (see map). 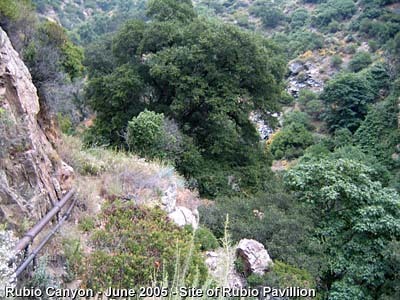 From Rubio Canyon, go to where the main trail arrives at the old pavilion site, near the second occurrence of the water pipe. A fork in the trail heads up the slope (C on the map, Incline Trail). The path climbs steeply, passing the now non-existent lower end of the tram bed. After a few minutes, you reach a series of short zigzags which takes you directly up the tram bed through a road cut, which Professor Lowe had dubbed, "Granite Gorge." At the top of the road cut are some old foundations. You look down into a chasm that had been spanned by trestles. Lowe had named it "Macpherson Trestle." The only thing that remains today are some footings from the trestle supports. If you're brave in heart, you can continue on by taking the route that climbs up the rocks on the left, then continues up the ridge to meet the tram bed on the other side of the chasm. Climb the tram bed via a zigzagging use path. Be careful and watch your step. Enjoy great views of the canyon to the north and the urban sprawl to the south. Shortly you reach the passing track section, the midway point where the tram cars passed each other. At the top end of this section, the route becomes more difficult and brushy (I have not ventured up the tram bed beyond this point). A narrow trail, however, veers off to the right (D on the map, Old Echo Mountain Trail). This route contours along the southeast face of Echo Mountain. Shortly the route cuts left and begins to zigzag up the slope (E on the map, Chalet Trail). A steep climb delivers you to the site of the Chalet and in another 50 yards you arrive at the Echo Mountain House ruins. This entire route from Rubio Canyon to Echo Mountain is somewhat rustic and quite steep in places and is not for the faint of heart or inexperienced. I don't know how often the trail is maintained, so it could get brushy and dicey in places. View my Rubio Canyon Report - 10-30-04 and my Hiking Blog - 12-27-10 for more information. From the top of Echo Mountain, you can either return the way you came or descend via Sam Merrill to the Cobb Estate trailhead. Unless you have arranged a car shuttle, the walk between the trailheads of Rubio Canyon and Sam Merrill Trail is about a mile. 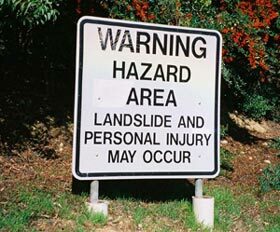 Trailhead warning sign - At the beginning of the trail a white sign reads: "Warning Hazard Area Landslide and Personal Injury May Occur." It was placed there in reference to the blasting that they had been doing back in 1998. Currently, the threat from blasting is no longer present. However, there can still be some loose rock on the slopes, particularly around the falls and after rain, so exercise care when exploring around. Rough route - The quarter-mile walk from the pavilion site to the Moss Grotto/Ribbon Rock Falls scrambles over a rock-strewn creek bed. It's not necessarily a simple stroll but shouldn't pose unreasonable difficulty for a person with good legs and feet. The route may be uncomfortable for a person who has no experience with off-trail hiking. But I say, don't hurry, watch your step, and be careful. In the rainy season, the water in the creek can flow briskly and pose some additional risks. Alternate routes from Echo Mt. 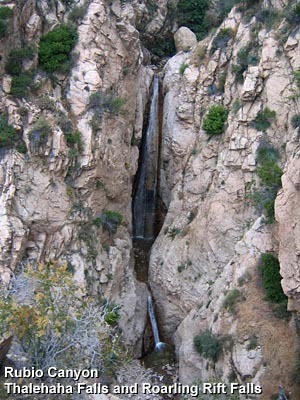 - You can hike down Rubio Canyon to the gorge below Leontine Falls. For a hike description, visit Christopher Brennen's Hike D3. 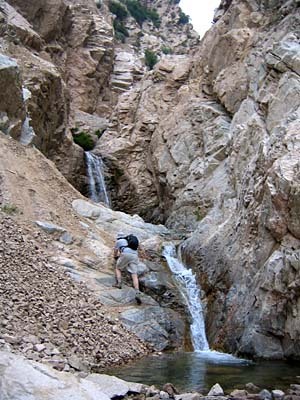 Rubio Canyon in his Adventure Hikes and Canyoneering in the San Gabriels website. He presents two routes descending from Echo Mountain. There is also a remnant of other old trails networking throughout the canyon, most of which are not maintained but can offer an adventure for the die-hard explorer. 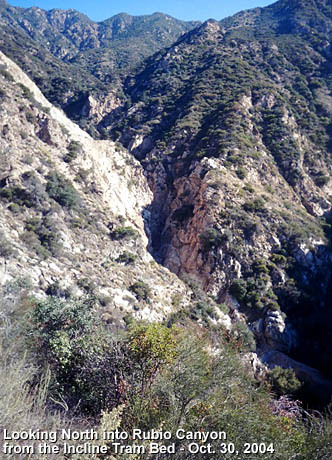 Arroyos & Foothills Conservancy (AFC) - Much of mouth of Rubio Canyon, including the land that the hike to the falls passes through, has been preserved by the AFC, a local non-profit land trust. Visit their website for lots of helpful and interesting information about trail restoration, volunteer opportunities, docent-lead hikes, events, news, history, membership, and how to make tax-deductible contributions to their important work. 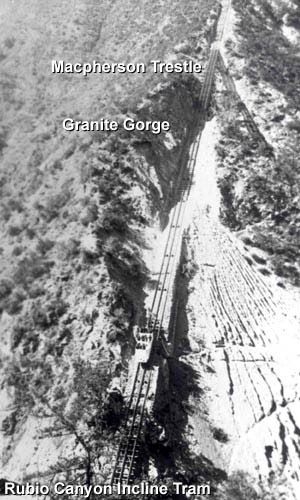 Mount Lowe Preservation Society - Handsomely presents a wealth of information about the Mount Lowe Railway, including Rubio Canyon and the falls. The Archives and Artifacts section displays a rich collection of more than 200 images of historic brochures, postcards, ticket stubs and more. Professor Thaddeus Lowe - by Lance S. Ferm (great-great grandson of Thaddeus and Leontine Lowe). Provides a biographical treatment highlighted with photos, including lots of old photos of the Mt. 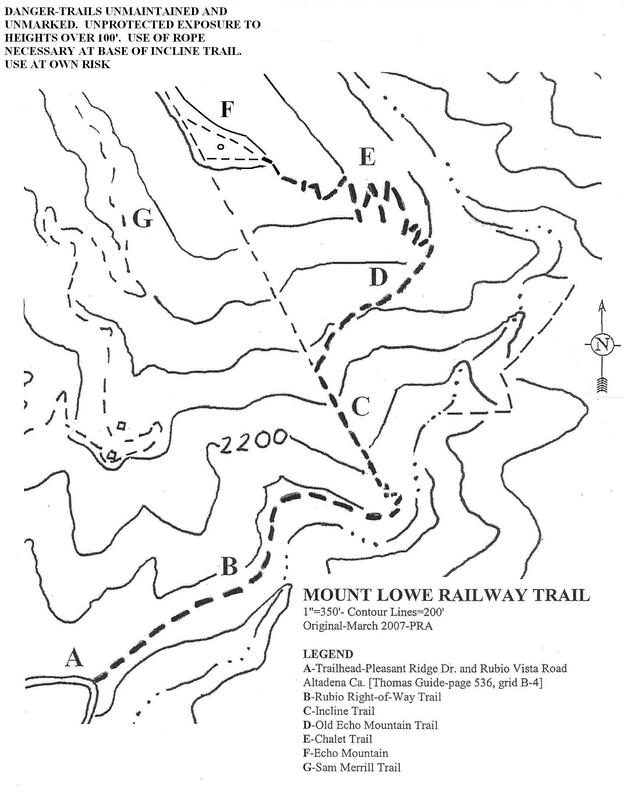 Lowe Railway, Rubio Canyon, Echo Mountain, etc. 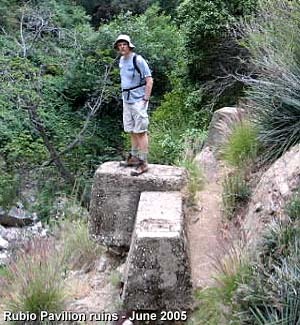 Rubio Canyon - Tom Chester provides background information, history, a historical timeline, a hike report, and links. Includes a report by Paul Ayers describing the aftermath of the October 2004 storms and Rubio Canyon. The Water Falls of Rubio Canyon - Written by Troy Sette and edited by Tom Chester. Thorough information. The Far Side of the Sky: Rubio Canyon - by Christopher Earls Brennen. Provides the following: a history of the canyon and the exploits of Professor Lowe, recollections from 1969 and on of his early visits to the canyon with his daughters, a detailed narrative of a February 1998 mountaineering trip down the canyon (with photos), a description of the work began in April 1998 that led to the infamous rockslide that buried the falls, an eye-witness account of exploring the canyon in September 1998 and being stunned by the damage, and a description of a further visit and more exploring of the damaged area. For an excellent hike description of a rapelling adventure down Rubio Canyon visit Christopher's Hike D3. 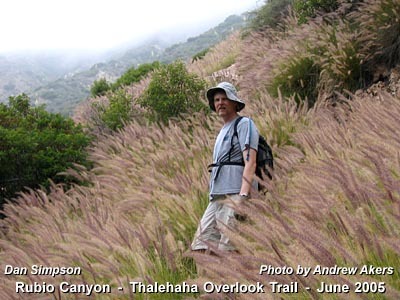 Rubio Canyon in his Adventure Hikes and Canyoneering in the San Gabriels website (including a topo map and photos). 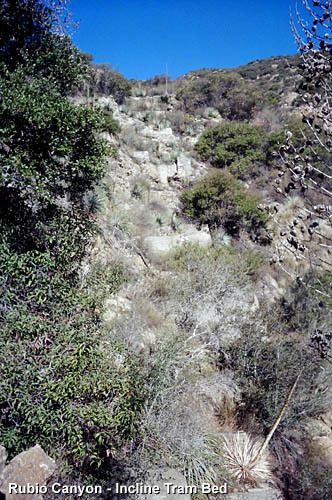 Altadena to Rubio Canyon - Hike report by Roy Randall - September 26, 1998. Roy presents a detailed description and some photos of the hike to the base of the rock slide that covered Moss Grotto and Ribbon Rock Falls (which Robinson mistakenly calls Leontine Falls). Roy mentions two small falls (about 5 feet and 10 feet high) which are now buried under rock from the October 2004 debris flow. He includes a note by Troy Sette giving some historical background to the "seven falls of Rubio." Echo Mtn. Echoes: Remembering Rubio Canyon (Vol. 4 No. 2) by Jake Brouwer - An excellent historical treatment with lots of vintage photos. Peruse around the site for a wealth information: Index Page. Rubio Canyon and the Mt. Lowe Railway - by Paul Ayers of the Scenic Mount Lowe Historical Committee. Offers a detailed history. Altadena Trails - Information about Hiking, Mountain Bike and Equestrian Trails in the Altadena Foothills. Altadena Weather and WeatherCam - by Bill Westphal. The camera is mounted on his house near the head of Lake Avenue, offering real-time images of the mountains. Trails of the Angeles: 100 Hikes in the San Gabriels - by John Robinson with Doug Christiansen (Wilderness Press, 8th Edition, April 2005). Hike 25: "Altadena to Rubio Canyon" - Nice historical background and trail description. Robinson's 7th Edition (September 1998) is outdated and somewhat inaccurate. He mentions two washed out places where "you must cross small gullies." This condition no longer exists; the trail nicely skirts them. The first two small falls he mentions are now covered with rock. He mistakenly identifies Moss Grotto/Ribbon Rock Falls as Leontine Falls, which is actually further up the canyon. The 8th Edition updates the description. Los Angeles County: A Day Hiker's Guide - by John McKinney (The Trailmaster, 2006). "Rubio Canyon." Good historical background and trail description. Puts hike at 2 miles round trip with 200 feet in gain to Moss Grotto and Ribbon Rock. Briefly describes the continuation route to Grand Chasm and Thalehaha Overlook. California Waterfalls - by Ann Marie Brown (Foghorn Press, 1997). Her trail description in this edition was written before the 1989 landslide which buried the canyon and the 2004 storm that cleared it. She mentions features and conditions that no longer exist. This page was last updated November 29, 2013.